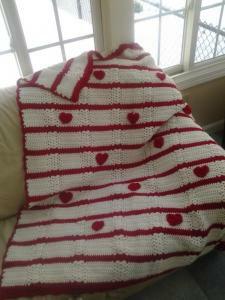 http://www.redheart.com/free-patterns/be-my-valentine-throw . I would like to make this for my dad who is undergoing chemo right now. Why This Project Is a Challenge: I start many projects but do not complete them. I tend to enjoy the process more than the final product. I am competing and will be making 4 baby blankets and 4 baby hats in the sixteen days of the games. No specific pattern as I want them all to be different. As to why this will be a challenge I will just state that I currently have 4 of my 5 children and all 4 of my grandchildren living with my husband and I. I also work outside of the home and am taking care of my very pregnant daughter who will be having my 5th grandchild very soon (possibly during the games). Thread crochet. I have a big bag of thread and patterns for earrings and bracelets that I just can't seem to get to. I plan on finishing at least two items per day while continuing to make lapghans and baby blankets for a childrens hospital. Have you tried any of the thread hooks with larger handles? I couldn't even work with thread until I found them. Details About Your Project: I am making a freeform chicken centerpiece for my mother's breakfast room table. 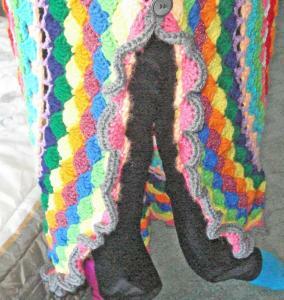 I will design, make the pattern, and crochet a thread piece approximately 20" in diameter. I will be using a combination of thread and embroidery floss. Why This Project Is a Challenge: The time limit is going to be a killer. Why This Project Is a Challenge: This is a challenge because I'm fairly new to amigurumi yet and there is no pattern for it. I'm also trying to make a 3D doll off of a 2D picture. There's also going to be multiple color changes. And the spacesuit helmet is a fishbowl style. I haven't completely solved the problem of how I'm going to do that, although I have some ideas. So this is definitely going to be a challenge for me. I have several projects in the works already, and have to question myself as to whether or not starting another project would be such a good idea; HOWEVER - this looks like so much fun, and I haven't really challenged myself to start and finish a project in a set amount of time before. So, here goes!! EDIT: I am approximately 98% finished with my project. Not completed, but it will be very soon! I'm pleased with my progress and the amount I was able to get completed. Have decided that I need to drop out. 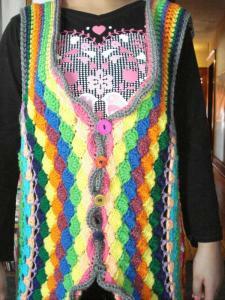 I am still going to work on this cardi, however, I have not had the opportunity to start it yet. 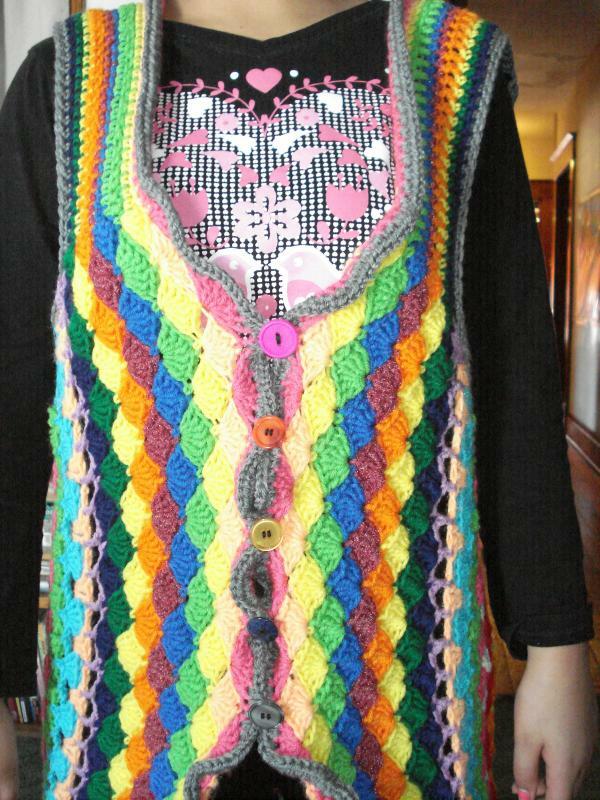 I have also been commissioned to make a scarf. I am working on another CAL and hope that the next time around I can truly commit to this. You all have a great time. 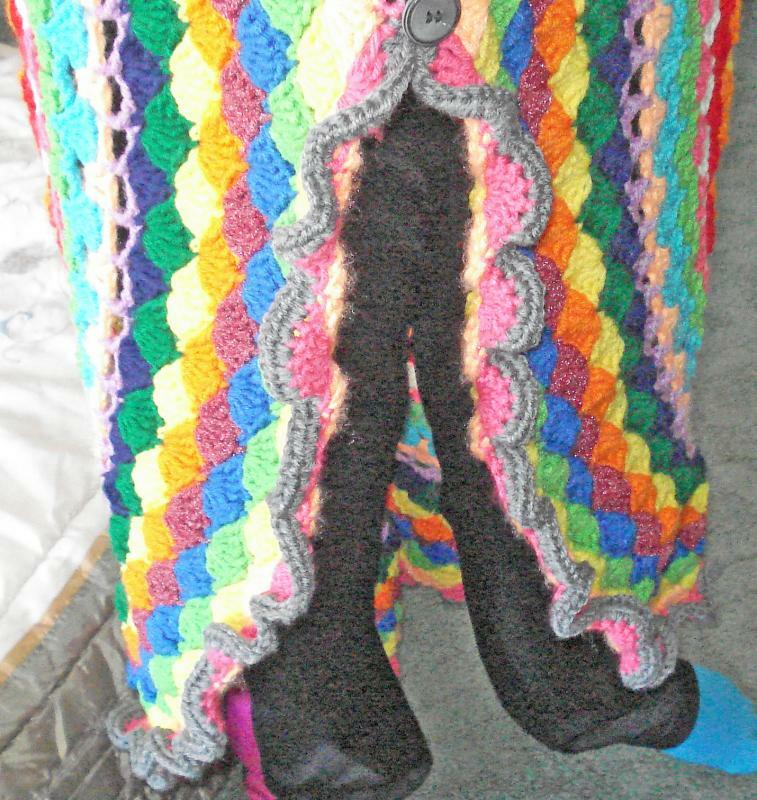 I finished the afghan in time!! Wow! That was fun. I'm giving it to my Dad today.